Mid 80s proto-janglers Here Comes Everybody inspired Andy Bell (Ride/Oasis) to buy his first guitar, then, mission accomplished, broke up in 1986. Singer/ guitarist Richard and drummer Pete were introduced to bassist Alan by some HCE fans at St Paul's Arts Centre later that year, and The Anyways' core trio was born. 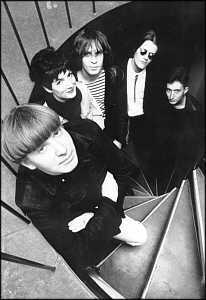 Their goal was to wear black and sound like The Velvet Underground, but luckily they got it slightly wrong and ended up sounding like themselves (while still wearing black). Jennie used to read the newspaper onstage and on one occasion shorted out the keyboard by pouring fizzy pop into it. Trudy, a volunteer mental health worker, brought a big following from the Mill Drop-In Centre, to liven up the usual anoraked indie audience. Sounds reviewed the band's second gig, The Television Personalities offered support slots at the 100 Club in Oxford St, and Notown Records put out the first single, Confession, in 1987. Overcome by the excitement of being played on John Peel (once), Jennie left, and Ali took her place. The Anyways became regular performers at the Camden Falcon, where Bobby Gillespie told them they needed more guitar solos. Two tracks (no solos) were featured on The Jericho Collection in 1988 alongside Notown label-mates Shake Appeal (lots of solos). A video of rousing revolutionary anthem Levitate the Pentagon was shown on satellite TV at 2.00am. The Anyways played in Oxford, London, and Bristol with Talulah Gosh, Razorcuts, The Mission and Ride... and on their own at a Hindu wedding in Hendon (kicking off the evening with that cheery toe-tapper, Love Gone Bad). Band mantra Welcome to Psychedelic Country became even more appropriate when Hamish and Karen joined in 1990. An album (Love Lies) was recorded by Rich Haines at Dungeon Studios, but sadly not released. A swirling cover of George Harrison's If I needed someone graced a charity album called Revolution No. 9. Despite their sterling work on the swirling, Hamish and Karen decided to go more Country than Psychedelic, and left to form Lucky and The Losers in 1991. The final incarnation of The Anyways was completed by guitar maestro Mark, who had previously acted as friend and multi-tasking facilitator to the band for some time - in celebration, chilled Frascati was served to the new line-up onstage at the Zodiac in front of hundreds of delighted Heavenly fans. The Sunshine Down EP came out on Marineville Records in 1993, by which time Richard had received stage-fright counselling from Jonathan Richman and the band had supported Bad Manners at a college ball. Wider (not inspired by Buster Bloodvessel) was featured on the Days Spent Dreaming compilation. By now people wanted to spread their musical wings, so The Anyways' Grand Finale gig was held in 1994 at the Jericho Tavern (the band's spiritual home for many years).